The New Haven Chargers football team came up one yard short at LIU Post on Saturday, Nov. 10, in the NE10 Championship, as they lost 17-14. The first quarter consisted of a quick New Haven three-and-out followed by a Pioneers turnover on downs. The Chargers had a long drive of 11 plays and nearly five minutes, but gave the ball up at the LIU 12 yard-line on a fourth down. The first long drive for the Chargers was an accurate summarization of the day – close, but no cigar. Long Island took the ball 81 yards over 11 plays, a drive just over four and a half minutes, and booted a field goal to take a 3-0 lead with just over a minute remaining in the first quarter. Another three-and-out by New Haven gave the ball back to the Pioneers, who traveled 70 yards on another 11 play drive, eating up 4:47. The drive was capped by a rushing touchdown, extending the lead to 10-0. On the following drive, the Chargers went 10 plays, over 70 yards, to the 15 yard-line. An Ajee Patterson pass to senior receiver, Damon Rodgers, was brought 14 yards to the one, where it was fumbled up into the air, and into the opportunistic hands of LIU Post. One yard away, another chance by the wayside. With the two-minute warning having elapsed, a third-and-five pass from Patterson to graduate student receiver, Ju’An Williams, went for 46 yards and a touchdown. The half ended with the score at 10-7, with the Chargers back in the game on the scoreboard. A third quarter field goal at 4:39 tied the game. In the fourth, a drive of 14 plays and 5:59 off the clock ended in a New Haven field goal, shifting the lead to the Chargers, 13-10. 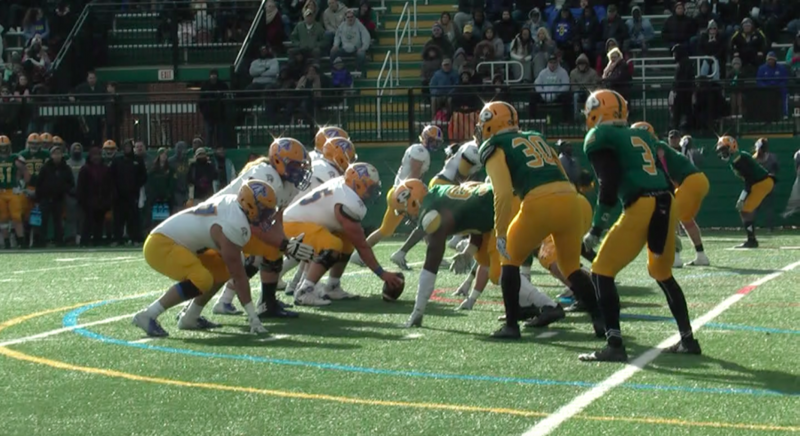 On the following LIU Post drive, a 44-yard passing TD gave the Pioneers the lead back. The next New Haven drive ended in an interception, followed by a three-and-out. New Haven took over, 37 yards away from the end zone, with 3:02 left to hoist the NE10 Championship. First and 10, a two-yard senior tailback Chris Liggio rush. Second and 8, a 7-yard catch by Rodgers. Third and one, a five-yard catch by Williams for a first down. A first down penalty moved the Chargers back to the 33 yard-line, and New Haven now needed 20 yards for a first down. On third down, a catch by sophomore receiver, Chris Carlyle, gained 19 yards, setting up a fourth and one. A Patterson pass to senior tight end, Jake Lareau, brought the Chargers down to the eight yard-line. Two straight missed opportunities with incompletions led to a third and 8, with 0:09 on the clock. Patterson got the snap, and the line in front of him folded. He scrambled to his right looking for somebody, anybody in a white shirt, but couldn’t. A forced throw to sophomore receiver, Brett Huber, was caught at the three yard-line, swarmed by green jerseys. He was brought down at the one, and LIU Post had won the NE10 Championship. The Chargers will now await their fate as they are in contention for a potential postseason bid in the NCAA Division II Playoffs.